Our friends Meghan Murphy and Claudia Abbott-Barish, two lovely California-based food and food justice activists, are traveling across North American in their cherry red 1980 Ford Courier pickup truck and touring bicycles… and making a stop in Montreal! They will be hosting the workshop “Radicalizing Herbalism and Activating the Healers” at the Dep on Sunday, August 14 at 6pm. 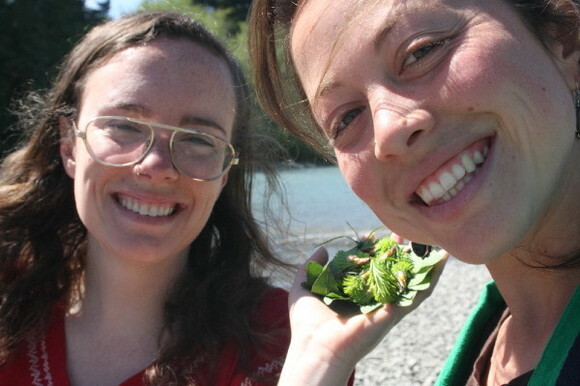 Both have been local food and food justice activists for many years and have come to look at their herbalism studies as another side of the same coin. Feeling a significant lack of social analysis and activism around herbal medicine as they have encountered it, they have been cultivating a common desire to radicalize herbalism, and mobilize healers to realize the innate activism in their pursuit of an alternative paradigm of healing. Not to miss an opportunity for broad geographical and social engagement, the ladies have decided to fold their road trip, cycle trip and workshop tour into one jammed-packed adventure of intrigue, physical tests, emotional and psychological trials, community involvement and anarchist hedonism. They’ll also be doing fun, hands-on activities like making salves, tinctures, and tea blends. Spots for registration are extremely limited, so please email me at natasha.pickowicz AT gmail.com for a spot. Unlike our other workshops, this event will be charged on a sliding scale of $10-20. Please pay an amount with which you feel comfortable. This workshop is aimed at healers, herbalists or self-taught herbal-medicine makers, who are interested in how their work can have a greater community impact beyond the traditional forms of engagement. That said, it is open to ANYONE who is remotely intrigued by the subject matter. Your contribution is valuable no matter who you are. For more information, please visit their website, Root Medicine. We hope to see you there! !